At the photo shoot for this story, Julie Cloutier, a representative from The Elizabeth Taylor AIDS Foundation, presented Chandi Moore with three ribbons to select from Taylor’s own collection, a gesture for being ETAF’s newest ambassador. 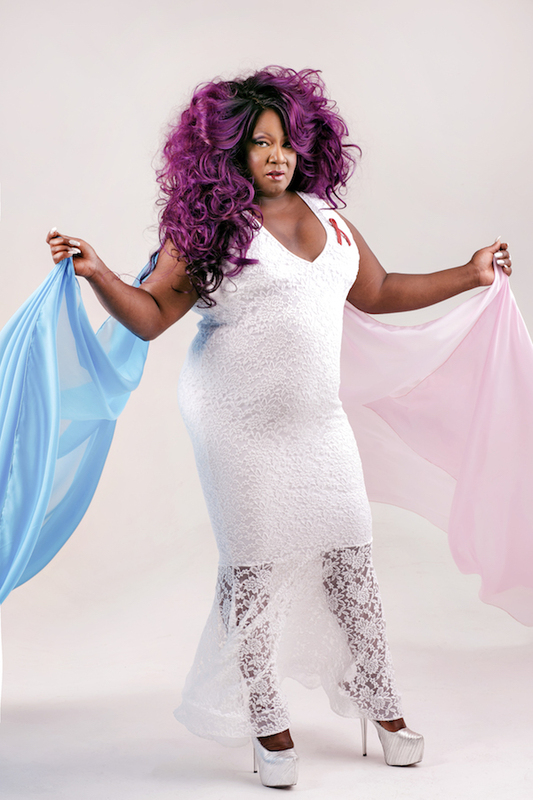 With her purple locks and long lashes, Chandi Moore’s public persona could be described as Big Beautiful Diva. 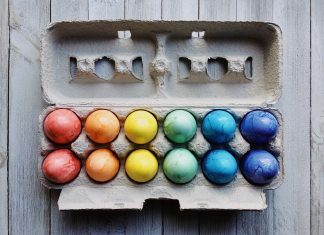 But when I sat down at her office at Children’s Hospital of Los Angeles, where she’s a trans youth health and HIV prevention educator, she came across as gently sweet, grounded, and other-focused. She tends to call people “sweetie,” which threw me at first. Chandi Moore may be the most famous person currently working at Children’s Hospital, thanks to reality television. Moore wasn’t looking for a role in television when Caitlyn Jenner’s producers discovered her in 2015. That led to an in-person interview, then a Skype interview, then a mixer where she met Jenner, and then a leading role on I Am Cait. 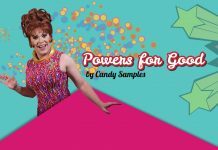 That role led to public disclosure, through televised heartfelt discussions with Jenner, of her struggles with coming out trans to her family and her run-ins with the law. 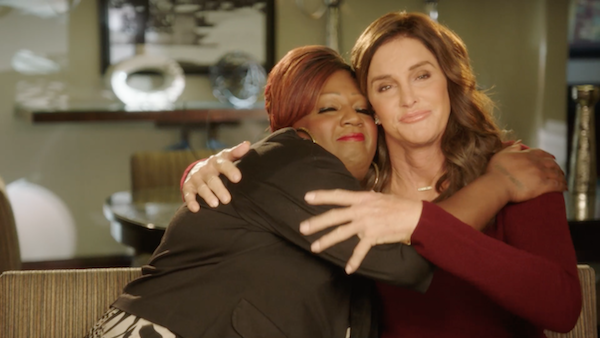 It also led to articles like “19 Times Chandi Moore Was the Real Star of I Am Cait” and random encounters on the street—almost all favorable—and even one at the Grand Canyon. For many trans people there are persistent questions of identity. The question is, first, who am I? After that question is answered it’s society that asks, daily: Who are you? So, for those who are inclined to tell her who she is, she has a simple message. Moore explains that her identity is not about “passing” as a woman. Growing up and just being was more of a challenge for Moore, she tells me. Born Earl Moore, she was raised in Los Angeles with three siblings by very religious parents. 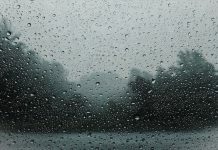 She now considers herself more spiritual than religious, but at the time her family’s devotion to the church put up extra obstacles to coming to terms with who she was. 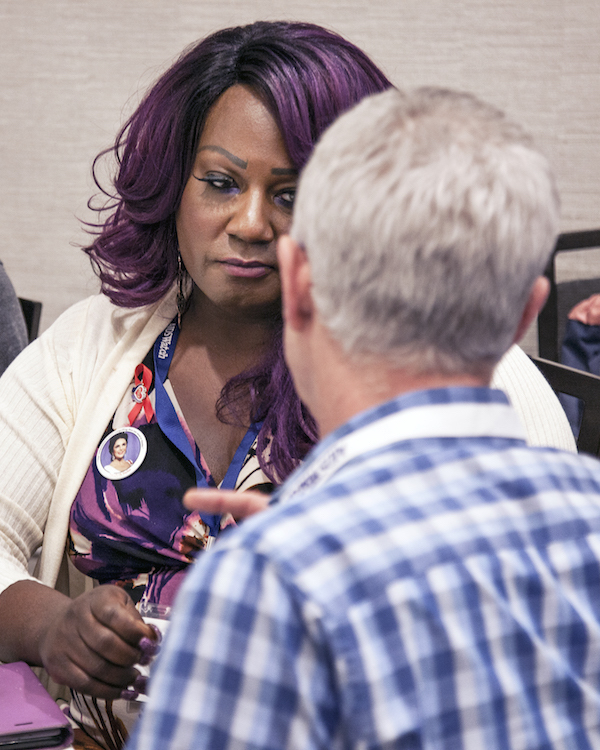 Moore, as an AIDSWatch 2017 delegate representing California, confers with a fellow advocate as participants broke up into groups by state to prep for the rally. Her transition was going to happen eventually, but it was a drag show at a straight nightclub in Culver City, California, that hastened the coming out, Moore says. And those people—friends—gave her a little push out of the closet by making her part of a drag show. She shortened it to Chandi, and the rest is history. But first, there was a stop in prison. On an episode of I Am Cait, Chandi confessed to Jenner about what she did to survive during the salad days of her transition. For those who didn’t see the show, here is the recap: In the early nineties she moved away from her family—cut ties with them—and ended up with what she calls an “unsavory crowd.” For survival money she resorted to check cashing, credit card fraud, and selling fake IDs. She was caught and sent to prison in 1992 and with good behavior served less than six months of a sixteen-month sentence. If you think that being trans in prison is difficult and degrading and humiliating, Chandi says you’re right. At the California Rehabilitation Center in Norco, she was placed with the general population of men, because that’s where officials determined she should be based on her genitalia. “There were 1,500 men in our area and eight of us were trans, but they wouldn’t classify us as trans. Their designation for us was PC, because we needed protective custody.” Except the PCs weren’t given anything close to protective custody. The authorities did nothing to protect her from the advances. What saved her was a friendship she formed with a straight boxer in her dorm who acted as her platonic guardian. 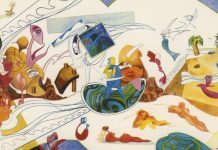 After getting out, she continued on her journey to transition and to figure out what she could be giving to the world. She reconnected with her parents, who put her through cosmetology school. With a beauty certificate she started working at the Beverly Center Macy’s cosmetics counter. 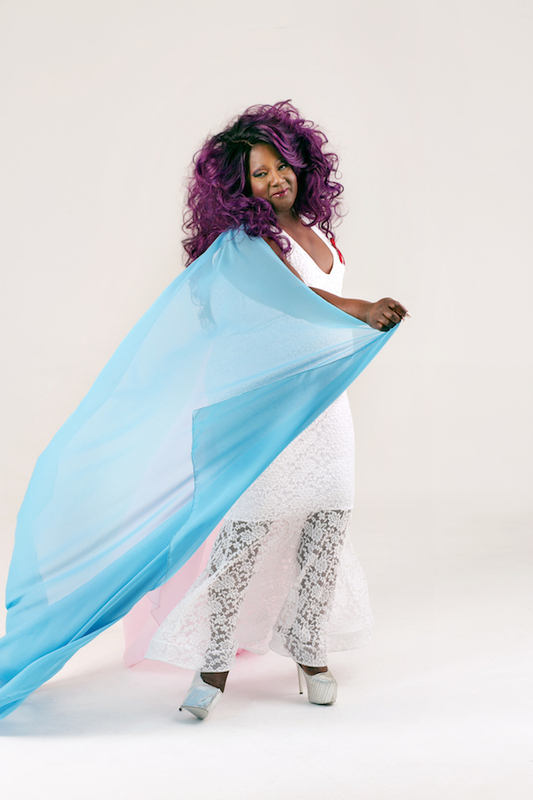 While working at Minority AIDS Project she volunteered with Trans GIA (girl in action) Divas to empower trans women. 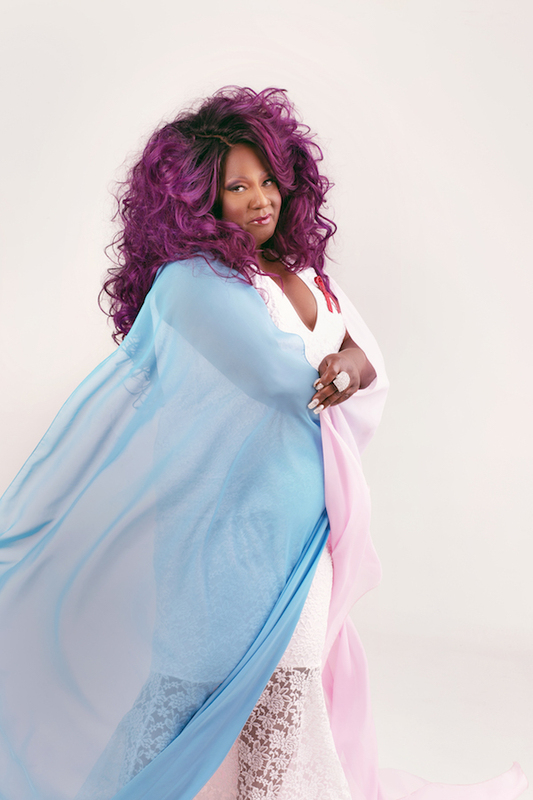 The group won the Trans Pride LA community advocate award in 2011. The statistics on HIV for trans women are shocking. 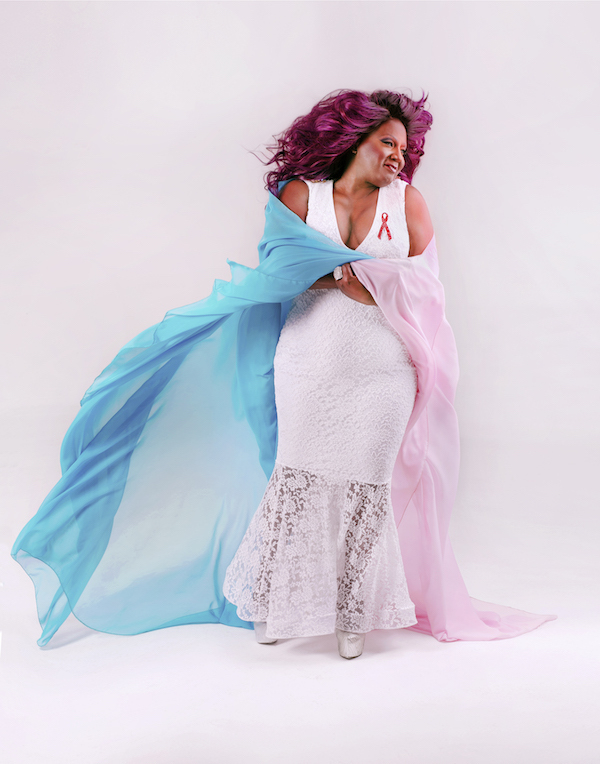 Studies show that transgender women are forty-nine times more likely to be HIV-positive and that one out of every three trans women of color is HIV-positive already. Moore explains that the high rate of HIV and STDs among trans women of color stems from how families and society treats them. Then Moore started hearing that friends were upset because she never disclosed her HIV status. So Moore made a Facebook post to correct the record, which ended up offending people who were positive. “They said, ‘Why did you have to say you’re negative? There’s nothing wrong with being positive.’’” The fact that she got flack from both sides Moore attributes to the stigma still surrounding HIV. All of her work in HIV education and outreach, though maybe not the public HIV misdiagnosis, could have happened without I Am Cait. But Moore says she’s glad the show gave her a bigger platform for the issues she was already talking about. One of the newer issues is reforming HIV criminalization laws. “HIV criminalization is very intricate and sometimes misunderstood at first even by the highly educated,” Moore says. In 1990 the Ryan White Comprehensive AIDS Resources Emergency (CARE) Act, required states to pass criminal laws (if none existed) to prosecute any person who knowingly exposed anyone to HIV. Thirty-two states in the U.S. still have HIV criminal laws on the books. Eleven states can send people living with HIV to prison for behaviors that pose no risk of transmission. 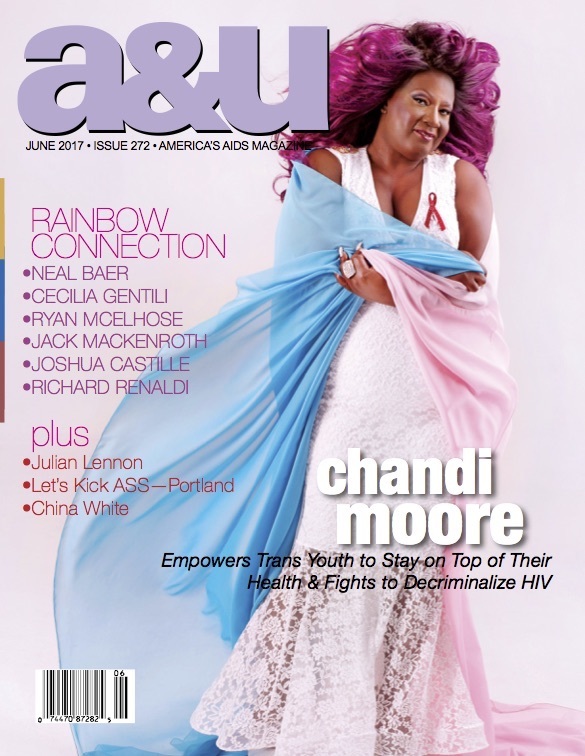 Moore’s first effort as ETAF ambassador is to encourage lawmakers to co-sponsor the latest iteration of the bill written by Congresswoman Barbara Lee (D-CA) [A&U, October 2012], the Repeal HIV Discrimination Act, which encourages states to review and reform statutes that can criminalize people living with HIV. “These laws that criminalize people using their HIV status are based on outdated science and discourage people from getting tested,” Moore says. Moore points to other laws she says are outdated, like felony solicitation enforcement, which disproportionately impacts transgender women of color. She says social media is one of the key ways she’s advocating for change, but being an ambassador for ETAF has allowed her to use her voice in other platforms. As for Moore’s relationship with her family, she tells me it’s never been better. Ever the helper, when she left her family in the early nineties, her concern was less for herself than for them. Make-Up and Hair by Sir Tony: www.beautybysirtony.com. Gown by Tony Iniguez Manaz: www.facebook.com/IniguezTony. Nails: INAILS. Manicurist: Vanessa Cun. Studio: Apex Photo Studios www.apexphotostudios.com. 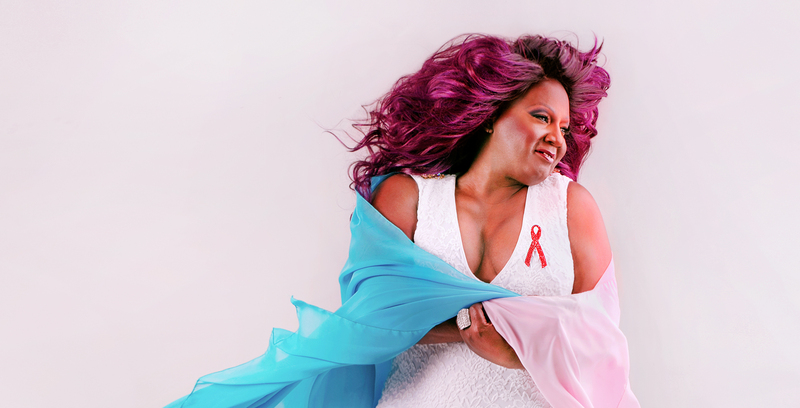 Elizabeth Taylor’s red ribbon worn by Chandi Moore, courtesy of The Elizabeth Taylor AIDS Foundation. Sean Black photographed Jenna Ortega for the May cover story. Follow him on Twitter and Instagram. Larry Buhl is a radio news reporter, screenwriter, and novelist living in Los Angeles. He interviewed actress Jenna Ortega for the May cover story. Follow him on Twitter @LarryBuhl.